Jedox is a broad platform. There is a huge amount of functionality under the covers that you have access to. Sometimes the manuals are a bit cryptic in their description of what is available. So over the next little while, I plan to expose a fair bit of this functionality and how it is used in a business context. Some of it is straightforward and some is quite complex, so bear with me and just take on board what you can understand. Feel free to ask questions. A key part of Jedox is its Excel add-in. It is by far the most popular and used front end for Jedox, given the ubiquity and flexibility of Excel. The main game, however, is the Jedox Web interface. It is powerful and flexible. More development effort has been put into the web interface than any other Jedox front end, which sort of indicates where Jedox AG sees the future of the product. Every wondered who is using your web reports? How often? What are the usage peak times, peak users? All that information is available in the core.log. It is a standard log file format, which is about as useful as an ashtray on a motorbike when it comes to reporting. So we need to parse it with the ETL to get something beneficial out if it. 2. Select an appropriate group to import the .pb file into and import it. 4. 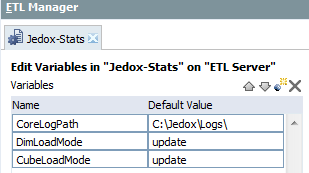 Download the Jedox-Stats.xml. This is a Jedox ETL Project. Open ETL Manager and import the project. 5. Download the Jedox-Stats.zip. Unzip this file. This is a Jedox database that you need to add to your Jedox data folder (stop the Jedox MOLAP Service first). 6. 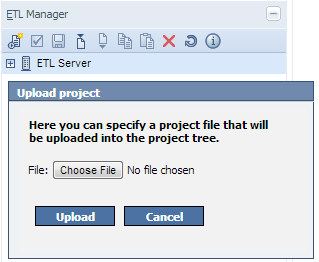 Start the MOLAP Service; change the path in the ETL Projects parameters / variables to match your system settings. The file path for the Core log is the most important one at this point. 7. Run the job-:CoreStatsBuild job. This will populate your cube with the settings from your system. The default ETL captures 2 measures – reports successfully loaded and reports that have been attempted to be loaded by users. The dash is pretty self-explanatory: the line chart on the left represents all hits and avg/hts per day as per your core.log. You can change server/date period at the top. The middle doughnut represents successful loads vs attempted loads. The chart on the right represents the top 10 reports by that selected period. The real interesting stuff here is the Top Times, Users, Reports. The top times are top hours in the day users hit the reports. Hover over the >> to see more information and click to filter by users for that time. You can select a user for that time and click the >> to see that users top reports for that time. Click on the report and it will take you to a simple analysis of that report by user. Select Top or Flop (bottom reports). 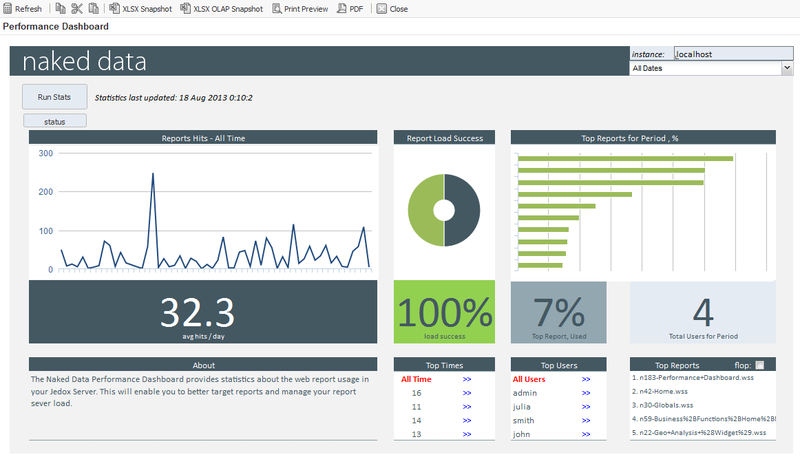 Click on a report and it will take you to further analysis by user of that report. Remember, this is just a template or starting point – it is just a Jedox Web page, and you can edit this yourself and customise it as required. Note: I use cell A1 to hide/unhide rows and columns (via Jedox (HIDEROW() and HIDECOLUMN() functions) used but not displayed. Change cell A1 to 0 to display all hidden rows/columns; enter 1 to hide again. This type of information is handy, especially when you are centrally deploying an enterprise rollout of Jedox to a wide user base and you need feedback on what reports that users are using and which ones they are not. This ensures you are targeting your reports correctly and it provides insight into how users are interacting with the reports. This entry was posted in Jedox Web and tagged Business Intelligence, Jedox, Naked Data, Performance Management, Web Reporting on September 12, 2013 by Chris Mentor. just a little question. I only see a link to the webreport, but no link where I can download the ETL & Database. Where can I find this? Upload the .pb file onto File Manager. You will see the .xml and database.zip file in there. You can then download the files from there.